Blackinton B521 Shield Badge with Eagle - B521 - 1 11/16" x 2 5/16"
Home > Blackinton > Police Badges > Badges with Eagles > B521 Shield Badge with Eagle - B521 - 1 11/16" x 2 5/16"
B521 Shield Badge with Eagle - B521 - 1 11/16" x 2 5/16"
Here we have this shield badge with eagle from Blackinton, style number B521. 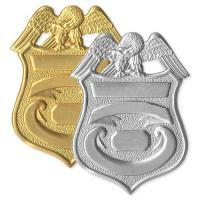 Made in the USA, this badge is available in several finishes and can be customized for your department. It measures 1 11/16" x 2 5/16" and features a durable finish that lasts. The integrated eagle design is a hallmark for law enforcement. If you need your badge to look good for years to come, Blackinton has you covered! Please allow 4-6 weeks for delivery as these are fully custom and made to order. Dimensions: 1 11/16" x 2 5/16"
Shield Badge - B1246 - 2 3/4" x 2 1/4"
Shield with Crown - B1174 - 2 3/8" x 1 3/4"
Shield Badge - B1387 - 2 5/8" x 2 1/4"
Shield Badge - B597EO - 2 1/2" x 2 1/8"
©2002-2019 CopsPlus.com: Blackinton B521 Shield Badge with Eagle - B521 - 1 11/16" x 2 5/16"